Welcome to Today@WKU, the daily newsletter from WKU Public Affairs, for October 17, 2018. 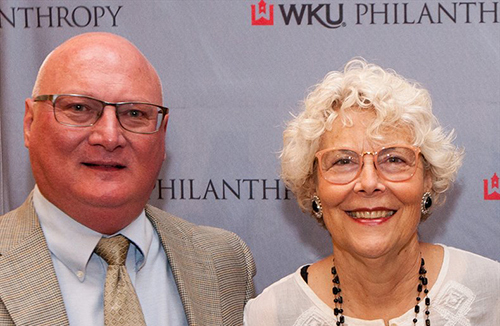 Joe and Susan Walters establish professorship in marketing: Joe and Susan Walters of Campbellsville have made a gift to establish the Joseph L. Walters Professorship in Marketing in the Gordon Ford College of Business. Premiere screening of KET's Robert Penn Warren documentary Oct. 22 at WKU: A free screening of the KET production Robert Penn Warren: A Vision will be held at 6 p.m. CT Monday (Oct. 22) at WKU's Van Meter Hall. The screening of the hourlong documentary will be followed by a Q&A with Rosanna Warren, Warren’s daughter, and producer Tom Thurman. What’s Happening at WKU: Check out a list of events through Nov. 3. Men’s basketball: Every Hilltopper Game Selected for Broadcast/Streaming: Every WKU Hilltopper Basketball game in the 2018-19 season has been selected for national broadcast or digital streaming, as announced Tuesday by the Conference USA office. The Hilltoppers are scheduled to play 12 games on the ESPN family of networks, three games on CBS Sports Network, three games on CBSSN on Facebook, two games on beIN SPORTS, one game on Stadium and six games on Stadium on Facebook. Women’s basketball: Four Lady Topper Games Selected for ESPN+ Streaming: Four WKU Lady Topper Basketball games have been selected for streaming on ESPN+ as announced by the conference office on Tuesday morning, with the Lady Toppers taking on Louisville and Middle Tennessee at home and UAB and Marshall on the road on the new streaming platform. Volleyball: Lady Toppers Drop Five-Set Battle at Austin Peay: Senior middle Rachel Anderson racked up 17 kills across WKU Volleyball's five-set loss at Austin Peay Tuesday night. The Lady Toppers grabbed victories in the first and fourth sets as the final scoreline read 26-24, 23-25, 16-25, 25-15, 10-15. Next: WKU vs. North Texas on Friday night. Men’s golf: Sargent, Hilltoppers Finish Under Par at Georgia State Tourney: WKU Hilltopper Golf's Billy Tom Sargent shot his third straight round under par Tuesday at Georgia State's Autotrader Collegiate Classic, finishing tied for 17th. The redshirt senior Sargent led the Hilltoppers with a 4-under 212 (70-71-71) tally, one shot ahead of junior Tom Bevington, who tied for 19th at 213 (73-67-73). Next: The Hilltoppers finish their fall competition at Kennesaw State's Pinetree Intercollegiate on Oct. 22-23 in Kennesaw, Ga.
WKU Office of Scholar Development celebrates 10 years: The 2018-19 academic year marks the tenth year since the Office of Scholar Development at WKU was created. Established in 2008, OSD helps WKU students apply for, and win, nationally competitive scholarships. 2 p.m.: Presentation: Work/Life Balance by Allison Ball, Kentucky state treasurer, and Asa Swan, chief of staff for Kentucky Transportation Cabinet. Downing Student Union, room 2081. Contact Alicia Fryia, (270) 745-4559.